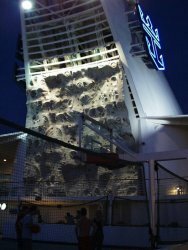 My second cruise was aboard the Explorer of the Seas in January of 2001. It was the last cruise before the post 9/11 era kicked in and it followed two years after my trip aboard the historic Sovereign of the Seas in 1999. Talk was already in the air about the Voyager class ships when I first cruised and I very much wanted to experience the difference as I planned for my second. The Explorer of the Seas had an itinerary that fit my schedule and she was herself only a few weeks into her revenue service when I sailed on her. Explorer was the second of the Voyager Class to be completed. She was so early in her run that I fortunate enough to receive special book commemorating her inaugural season. I was told in speaking with some of the crew during a reception later that half of Explorer’s crew was actually drawn from the Voyager which had just completed her first full year of revenue service slightly more than a year prior. The other half were largely new either to service on cruise ships or Royal Caribbean itself. She is largely identical to her younger sister ship though the decor aboard is more muted in tones and features an “explorer” motif which is fitting given her name. The artwork features the historic figures in exploration like Magellan for example. She also has the classic two-tone blue pin stripe running from the bow to the stern. This would end with the Navigator of the Seas some years later. Explorer of the Seas was also the first cruise for which I drove to the port without any flight to cut the distance or time at all. Sailing out of Port Miami I choose to overnight in Tampa to visit my great aunt and after an extra early rise, drove to the rest of the way the next morning. This also was the start of my standing policy to arrive at the port early. Though the lines advise you to arrive at a specific time, I knew enough know I could get there early and board sooner than many others. The terminal was on the northeast corner of the port. I don’t recall a specific number but signs along the road directed traffic to the right place. The parking for the terminal was directly across from the bus and taxi drop-off and made for an easy chore of pulling luggage directly from my car to the porters checking-in the bags. As an added bonus, my early arrival allowed me to pick-up a breakfast sandwich and drink from a lunch cart serving crew and officers with time to spare during the lull between the passengers disembarking and the next wave starting to board. The interior of the terminal was much changed from 1999. The whole of the entrance from the baggage check to the gangway was now fully decorated. However the full body of passengers were lead in single file into a line which fed the check-in desks. This lead to a long line of people and somewhat uncomfortable standing for nearly an hour after the actual boarded had begun. However the old exterior walkways were replaced with modern airport style boarding bridges. Boarding Explorer quickly erased all lingering discomfort from standing in the terminal. The crew had turned the cabins around, the Windjammer buffet still had breakfast to be had and the ship’s deck band had already started playing near the main pools. After securing my seating for the main dining room I set to tour the ship. I found the Royal Promenade to be more spacious than expected, even after viewing a year's worth of documentaries and videos about the ship’s design and construction. Everything about this ship, compared to Sovereign of the Seas or ships of it’s scale was larger on Explorer. The gym was open and very well equipped. The spa was enormous with ample lobby space to prevent the halls and treatment rooms from being crowded by people coming and going. The promenade deck circling most of the ship was wide and often an appealing place to escape the parades or events taking place on the Royal Promenade. The theater was comfortable with enough space to allow for elbow room and clean sight-lines. There were some support beams which obstructed the view from a limited number of seats, but never enough to make sitting near one a problem. The elevator bays were more numerous than I had seen before and gave plenty of space for people to get on and off. The decor overall was of muted pastel and wood tone colors. Nothing so vibrant as annoy one seeking to relax. The stateroom I choose was the unique type the Voyager class introduced. It overlooked the Royal Promenade. The window provided a great chance to watch people which is often one of my favorite activities onboard. It doesn’t differ from any other inside cabin except for the modest seating space at the windows edge. The ships stores were arranged along the Royal Promenade and ranged from high-end retail goods to sundries and branded gear with Royal Caribbean’s logo. Dining was among the best I’ve experienced on a Royal Caribbean cruise. The wait staff locked down my drink interests and timing well and sitting with a table of strangers wound-up becoming a conversation starter of sorts as they asked about our excursions and such. Entertainment onboard spanned the usual classics such as the “Not so newlywed game” to musical reviews produced by the cruise line. The dance club was very compact and yet the design split the space up in a way that made it seem larger. There were lots of nooks to sit in out of sight of the dance floor and loud music aside one could still enjoy talking with somebody if desired. The Casino Royale, playing on both Royal Caribbean’s name and the James Bond movie was very open and airy. Smoking had been prohibited at the time I took this cruise and unlike later cruises on the line, there wasn’t an oppressive smell of chemicals attempting to mask cigarette smoke. Explorer of the Seas stopped at Nassau, St. Thomas, and Labadee. As I had two years earlier, I skipped Nassau, choosing not to leave the ship in favor of touring the vessel and enjoying a day without many people aboard. At St. Thomas Voyager docked at the West Indies Company (WICO) docks and I was able to enjoy some of the best duty free shopping I’ve seen at the mall attached to the facility. As a U.S. territory I was also able to make use of the post office to send a bill home which oddly I forgot to take care off before leaving, curiously it got processed faster than when I mailed it from the U.S. proper. Labadee, Haiti was a very different place from it’s current form. No dock had been built by this time and arrival to the “island” was by tender. Never the less it was a delightful beach day though shopping was virtually non-existent in 2001. It was wise as usual to get back to the tender early and in doing so avoiding the crowds trying to get back to the ship at the end of the day. I did not book any excursions on this cruise. Between the ship and the duty free stores there was little need. Disembarkation was smoother than two years prior. Getting one’s bags was akin to the same process at any airport, finding a conveyor belt matching a ticket number and then moving to the customs lines. Customs was hard pressed in these early years to handle the large numbers of passengers coming off of a single ship but there weren’t any undue delays in getting to the car quickly.